Turn the Ignition ON & OFF. 2. Press & HOLD the receiver square (yellow) reset button for 4 seconds then release it. You'll hear a clicking sound (relay to flash the marker lights). 3. Press and release the LOCK button (only) on the first remote once. 4. Then Press and release the LOCK button (only) on the first remote a second time. Repeat these steps 3-4 for each remote that you want to work on the system. (DO NOT PRESS ANY OTHER BUTTONS WHILE PROGRAMMING THE RECEIVER). 5. Turn the Ignition ON & OFF. You're done. Verify that each remote has been "learned" by using all the buttons on both remotes. The New Remote's Lock & Unlock buttons will operate the entry door. The Hatch and Alarm buttons operate the Cargo Lock & Unlock respectively. 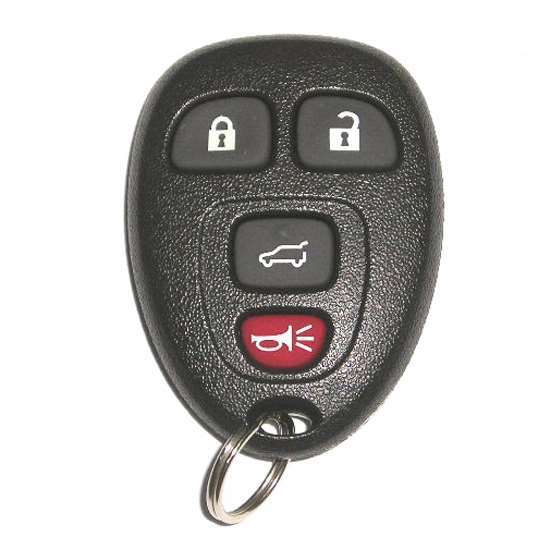 This keyless remote programming instructions work for 4B remote with part # 25830632, 22756460, 15857835, FCC id OUC60270, OUC60221 on the back of it. This keyless remote programming instructions work for 5B remote with part # 15913418, 20869055 FCC id OUC60270, OUC60221 on the back of it. The figure on top will be your guide when programming the remote. 3. Press and hold both LOCK and UNLOCK on the remote at the same time for 15 seconds. For vehicles with the memory recall seats, first remote programmed will be driver 1 and the second will be driver 2 and so on. You'll hear a chrime which indicates the remote has been programmed.